Peter Mayer, 83, of Fond du Lac, died Saturday, April 6, 2019 at St. Agnes Hospital. He was born February 19, 1936 in Kurd, Hungary, the son of John and Anna Stocker Mayer. Peter immigrated to the United States on September 3, 1956. He married Francisca Marquez on June 21, 1958 in Milwaukee and she preceded him in death on November 27, 1991. Peter worked as a brick layer for 30 years and farmed for 29 years. He was a member of the Brick Layer Union and Greater Beneficial Union of Pittsburg. 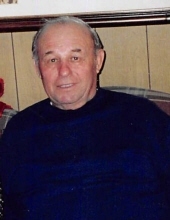 He enjoyed being on the lake at his lake home in Elcho and loved spending time with family. He is survived by one daughter, Patricia Mayer of Stevens Point; nine grandchildren, Jenny Gallitz, Christine Gallitz, Lisa Gallitz, Jean Gallitz, Amy Silver, Elizabeth Koch, Michael Koch, Danny Koch, and Samuel Koch; one sister, Anna Szunder of West Bend; nieces, nephews and other relatives. He was preceded in death by his parents; his wife; brother, Willie (Hedwig) Mayer; brother-in-law, Erwin Szunder; and special friend, Eleanor Chapman. The visitation will be held Saturday, April 13, 2019 from 9:30 – 11:00 AM at Uecker-Witt Funeral Home. The funeral service will be held at 11:00 AM on Saturday at the funeral home. Burial will follow in St. John the Baptist Cemetery in Woodhull. To send flowers or a remembrance gift to the family of Peter Mayer, please visit our Tribute Store. "Email Address" would like to share the life celebration of Peter Mayer. Click on the "link" to go to share a favorite memory or leave a condolence message for the family.